In those early years ,the services were conducted in St Inez Church and in the Bhatlem chapel. Efforts were made for construction of a Church of our own. Accordingly a plot for the church site was purchased in Ribander and the foundation stone laid on 23-9-1973, on the 50th Death Anniversary of Bishop Alvares Mar Julius. 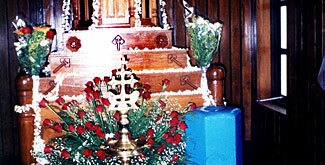 First services were held in the church during the Holy Week on April 1979. 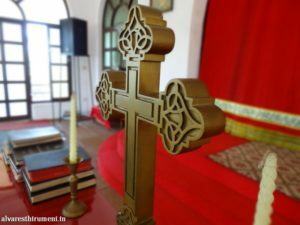 The relics of the Late Lamented Bishop Alvares Mar Julius were translated to church on 7-10-1979 and the church was consecrated on 7-2-1982 by H.G Dr.philipose Mar Theophilius Metropolitan of the Bombay Diocese. The book titled Patriot and saint on the life of the Late Lamented Alvares Mar Julius written by Dr. carmo Azaveddo, who had seen the real life of Bishop Alvares Mar Julius ,was released at the hands of H.G Philipose Mar Theophilius on 25-9-1988. Mar Alvares Julius charity fund has been institutes to render help to the needy and to give scholarship to poor students. Old church was demolished on 5-51998.During that time,Holy Qurbana was conducted from June to 3rd September 1998(Sunday ) in the chapel attached to Ribandar Hospital(present a MBA institute ).from 4th September 1998 (Sunday) on wards ,we conducted our regular services in the basement (parish hall)of our church. 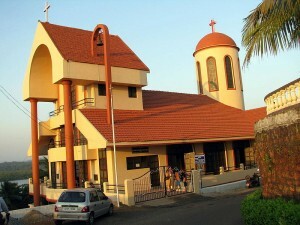 Consecration of our new church was conducted on 5th & 6th October ,2001, celebrated by his holiness Moran Mar baselios ,Mathew II (Catholicos of the east ).with the presence of his grace Thomas mar Athanasious,his grace Geevarghese Mar Cooriolos and vicar Rev Fr P C Thomas, Ex. Vicar Rev.Fr.T.E Isaac, Rev.Fr.Geevargese Iype and other Rev.Fathers and parishioners. a) It is decides to felicitate std.X student who scores highest mark in final examination,(minimum 1st class is needed) with a a cash award of Rs.501/- (rupees five hundred and one only ). b) For std. XII student who scores highest marks in Arts,Science & Commerce Stream in Final examination, will get a cash award of Rs,501/- (rupees five hundred and one only ). The students have to submit the attested marks sheets from the head of the institution for considering their cases.in both the cases Cash prizes would be awarded only to the children of permanent members of the church.